Straddling the junction of major interstate highways I-29 and I-90, Sioux Falls, South Dakota should not be one of those cities that most summer road-trippers zip right through. Whether you’re on your way to Mt. Rushmore or rushing back from Yellowstone, we suggest you pause for a few days and soak up the many fun, often free activities that a family can enjoy. Founded in 1856 among millions of acres of corn fields, here’s where you just might glimpse America’s heartland. While it’s hard to find the Sioux in Sioux Falls, it’s easy to find the Sioux Falls, the centerpiece of Falls Park. Open 24/7, the triple waterfalls, flowing for over 10,000 years, are the center of the city’s green life where locals and visitors come to play. The 123-acre park has a cafe, picnic areas, a few historic buildings like the Horse Barn and an abandoned mill, and pathways in and around the Falls to explore. Don’t miss the the 5-story viewing tower where you can get your bearings. The region’s famous pink granite Sioux Quartzite is easily seen around the falls. It has been used as a main building and paving material since the Pioneer Days and can be seen on many buildings throughout the region. From mid-November to the first week in January, Falls Park is transformed by light and snowfall (more than 22″ falls between November and February) into a glittery Winter Wonderland. The bike trail in Falls Park connects to more than 20 miles of the Big Sioux River Recreation Trail and Greenway as it follows the Big Sioux River and loops around the city. Relatively flat in town and along the riverbanks, this is a fun bike outing with the family regardless of fitness level. The trail also connects residents and visitors to a handicap accessible fishing hole, public golf course, canoe launches and restrooms. Pick up a Greenways Map from your hotel or Sioux Falls Visitor Center. Bike rentals available at Spoke-N-Sport and other shops. The old-fashioned style trolley that circles the main sights and streets recalls the horse-drawn streetcar that began serving Sioux Falls in 1887. It is a fun excursion for local and visitors alike. The friendly guides will point out highlights as you drive along, allowing passengers to get on and off at the various stops. The full tour, round trip, takes about 30 minutes and operates from Memorial Day to Labor Day. 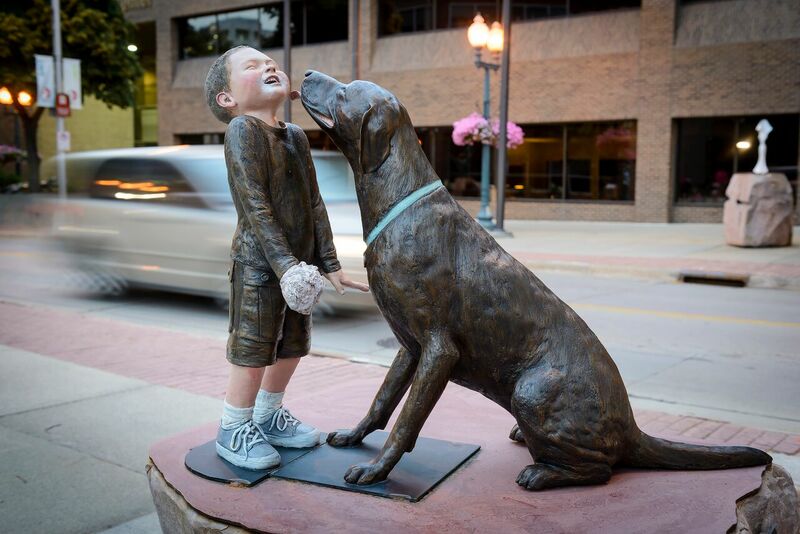 Sioux Falls’ commitment to public art is evident in the varied sculptures that you cannot miss on a stroll around town. They are there as a result of its annual SculptureWalk program, now in its 14th year, which turns the streets into an outdoor art gallery by displaying inventive sculptures of all sizes. Pieces are loaned by the artists for a year and are available for sale. There are 14 prizes including Best of Show, and the winning sculpture of the People’s Choice Award, selected by the public, is purchased by the city for permanent display. 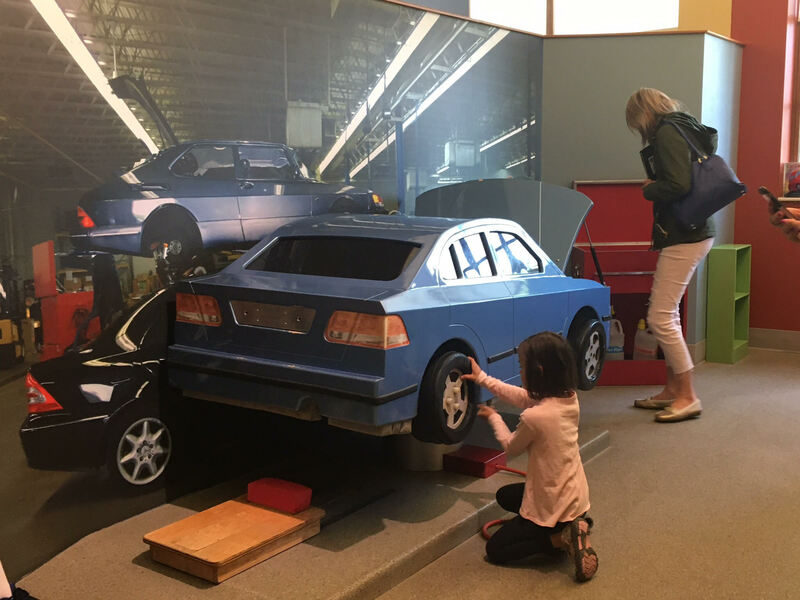 If you are in Sioux Falls, be sure to plan extra time for a day trip to nearby Brookings, only an hour’s drive, to visit the Children’s Museum of South Dakota. As a family travel writer and a mom, I have been to my fair share of children’s museums, and I think this is among the best. With indoor and outdoor areas and lots of opportunities for imaginative play on “Kidstreet” we couldn’t get the kids, even a 12-year-old boy, to leave. The grocery store and elaborate waterplay area were favorites of the younger kids and the Cloud Climber, a really cool climbing structure, enticed the older kids and a few adults. With a special area for infants and toddlers, an exhibit on life on the prairie, and fun experiments with airflow, you can spend hours watching and playing with your smiling kids as they experiment and learn. 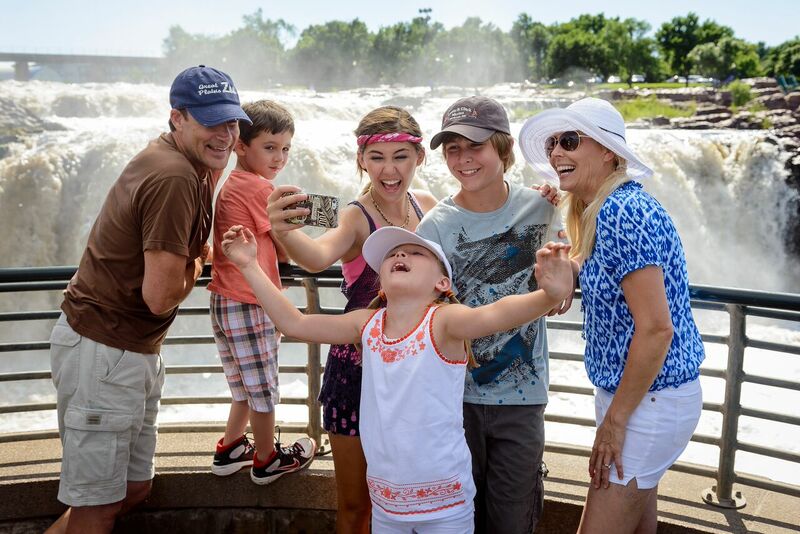 Your family can truly enjoy the great outdoors in Sioux Falls and have memorable adventures exploring the natural world of South Dakota. The impressive Outdoor Campus extends the classroom into nature, and features fishing, boating and park exploring with guides. Kids enjoy a wide range of activities including cross-country skiing, hunting and cooking, and will learn some real-life skills and get in closer touch with Mother Nature. The city has installed a small aquarium and a museum and nature center near outdoor trails and a playground. Take time to follow the easy hiking trails and guides for bird watching. 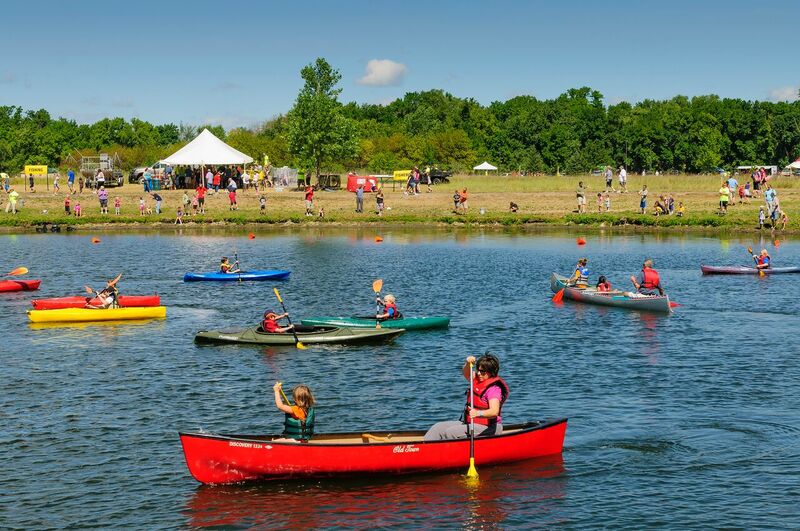 At our visit, an introductory kayak lesson was given to kids and adults who had a blast paddling around the pond. The staff was extraordinary, putting everyone at ease with their knowledge and experience. If your travels take you to Rapid City, there is a sister Outdoor Campus there. Take just a few steps from the Outdoor Campus to another cool spot. Open the double doors of the climate-controlled Butterfly House and flutter at the photo ops as 800 winged beauties land on your kids. Fruit-filled feeding stands attract the butterflies long enough for all ages to get up close and personal with many species from all around the world. Then head to the Cove aquarium to view hundreds of species of fish and corals, pet sharks and stingrays in the Touch Pool, and meet sea stars, sea urchins and anemones in the Pacific Tide Pool . More details at Butterfly House & Marine Cove. It’s not every high school (this one built of pink Sioux Quartzite) that gets cleverly converted in a multi-use arts, entertainment and science complex, and this one’s a big success. Areas in and around the former Washington High School gym include two performing spaces for music, dance and theater, plus a domed movie theater. The Visual Arts Center houses seven galleries featuring work of regional, national and international acclaim, including a highly regarding collection of tribal art, and a children’s art studio. 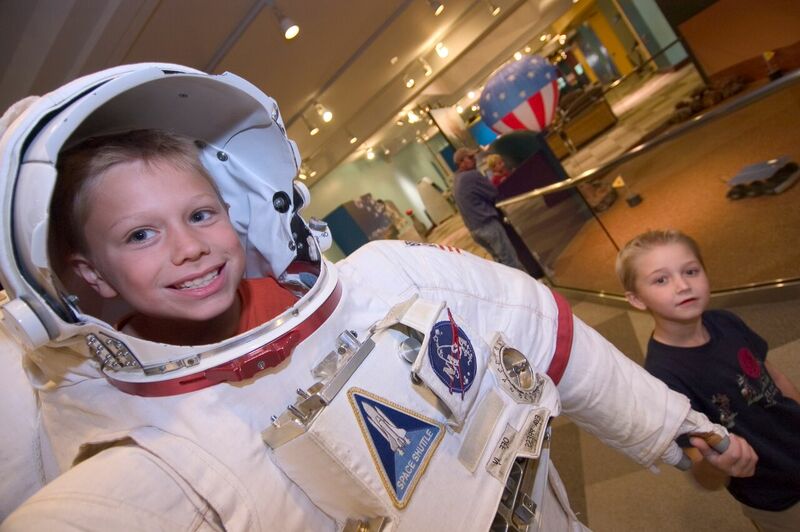 The Kirby Science Discovery Center features more than 100 hands-on exhibits for all ages in a compact, easy to tour space that even young children can explore. You can meet Stan, a replica of a 40-foot Tyrannosaurus Rex and learn about tornadoes. We liked the space gallery, and the live science demonstrations throughout the day. Learn more and order tickets for performances at Washington Pavilion. This is an unusual combination of rare animals preserved indoors at the Delbridge Museum of Natural History, and more than 1,000 live animals outdoors in more natural habitats. In addition to a walking tour in and around a variety of species, children will enjoy zookeeper chats, carousel rides, the Savannah Express train, and especially the camel rides in the Hy-Vee Face to Face Farm which also offers feeding and petting opportunities. Kids love the “Oreo” cows that are black and white, and the award-winning snow monkey exhibit where adults and babies swing freely and play in a glass-enclosed space. It’s nice to know that the Great Plains Zoo is a key participant in an endangered species breeding program which includes red wolves, snow monkeys, Grevy’s zebra and more. The memorial and museum commemorating the U.S.S. South Dakota, the most decorated battleship of World War II, includes photos and memorabilia from major naval battles in the Pacific during the years 1942-1945. Grandparents and kids will be impressed by the size of the ship’s 13-ton anchor and propeller -17.5 feet in diameter. Chislic, thought to be a traditional shepherd’s recipe, is made of chunks of beef, lamb or venison (beef is the least expensive meat available now) that are deep-fried in oil, then rolled in a paper bag filled with garlic salt till they have a tasty crust. It’s widely served with a side of chips. Cheese Curds are seen on most menus too, and are served fried, with a dipping sauce (ranch dressing or ketchup) and people pop them into their mouths like candy. Other local specialties include buffalo burgers (leaner than beef) and walleye (a tasty fish that swims abundantly in the waters of South Dakota). Hot Dishes (what east-coasters call casseroles) are very popular. We were told that a Tater Tot Hot Dish, made with browned onion and ground beef, green beans and corn kernels, topped with cream of mushroom soup and frozen tater tots is real comfort food. Kuchen, which means “cake” in German is the state’s official dessert. An homage to the German roots of many residents, the word refers to several kinds of traditional baked goods – fruit, nut, or custard-filled or topped with cinnamon and sugar. Native American influence is evidenced by the popularity of Indian Tacos which are made with fry bread. Beef and/or beans, chopped lettuce, tomatoes, shredded cheese and chilis are prepared as they are for classic tacos, but placed atop or rolled into soft, pillowy Indian fry bread. Fry bread is also served as a sweet, with toppings like jam, powdered sugar, honey and wojapi which is a pudding-like sauce made with native American berries, and is very tasty. Who doesn’t like ice cream? Word has it that the Dairy Bar at South Dakota State University in Brookings makes the best in the state. The Dairy and Food Science students make more than 60 flavors, and they are available at the school, in restaurants and at retail locations throughout the state. I didn’t have a chance to taste it, but I did taste Stensland Family Farms Ice Cream produced at a family-run (for seven generations) dairy near Sioux Falls. Authentically “farm to table,” from cows who eat the healthiest balanced diet possible, the ice cream was rich, creamy and memorably yummy. Available in several flavors, Stensland Farms also produces milk, butter, cheese and cheese curds (of course). Farm tours are available. For more information about Sioux Falls, contact the Sioux Falls Convention and Visitors Bureau where informative maps and brochures are available for download. I never knew South Dakota was an ice-cream hotspot, sounds like a great place for foodie familes. The local dishes–I need to try chislic–are making my mouth-water. Thanks for such an informative peice on a part of the country I know so little about.